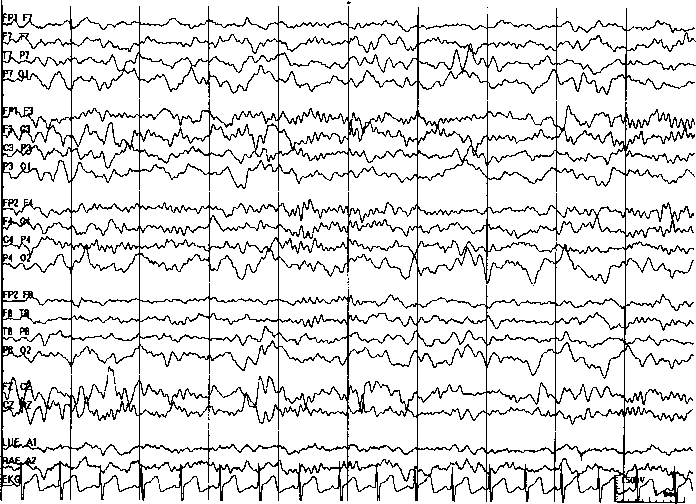 The patterns observed in the neonatal EEG and the significance attributed to them depends on the conceptional maturity of the infant. 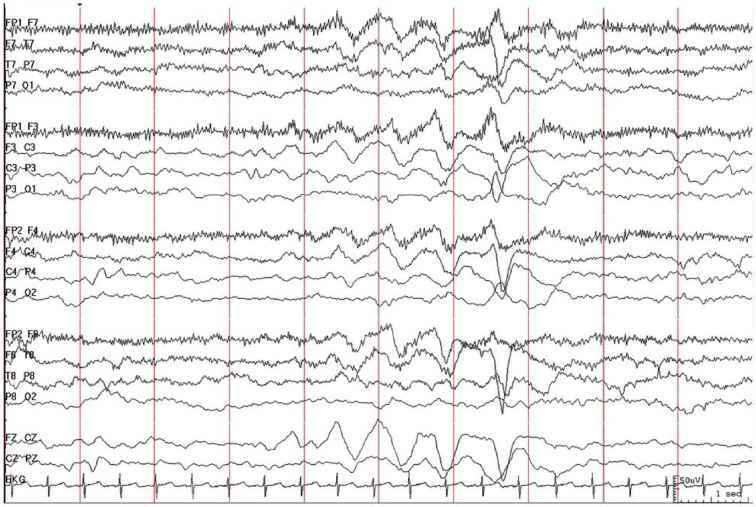 Therefore, to evaluate the neonatal EEG, the reader must know the conceptional age of the infant (duration in weeks since last menstrual period/beginning of pregnancy), in addition to the postnatal age. Patterns observed also depend on the infant's state of arousal, and this should also be noted. 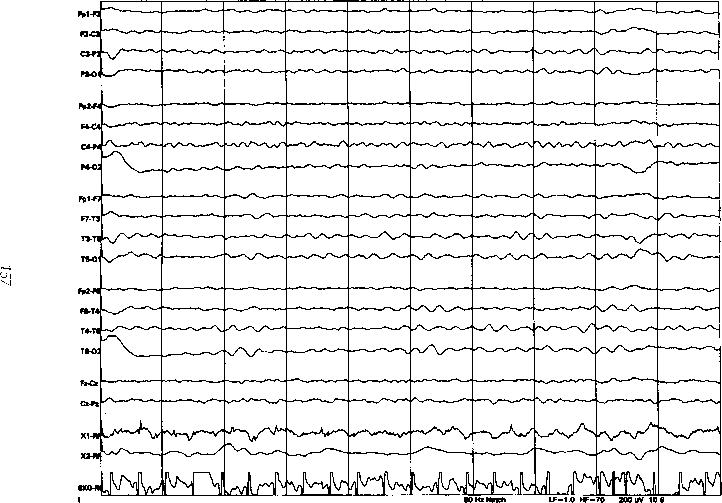 The EEG patterns are evaluated in light of these conditions. may be prolonged, up to 90 s or more, whereas active bursts are generally shorter, but may last up to 1 min. This pattern is described as trace discontinu (Fig. 1). At this early stage, there is virtually complete synchrony between the hemispheres. 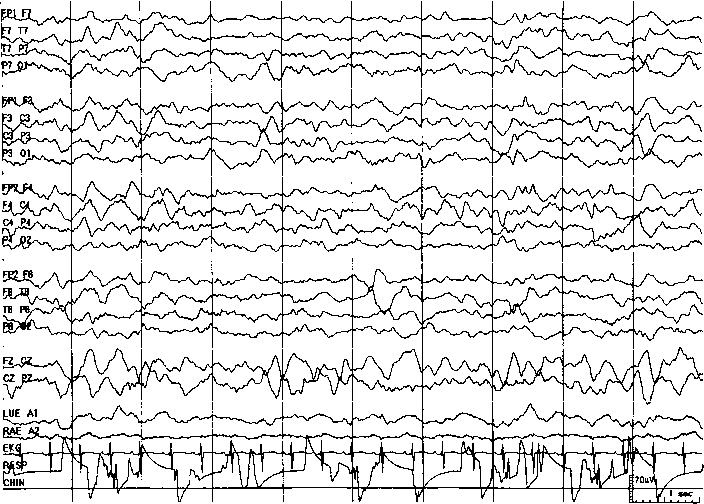 The EEG is invariant with clinical sleep or wakefulness, or with stimulation. The bursts of activity are predominant in the parasagittal and occipital areas, with relative inactivity in the temporal areas. 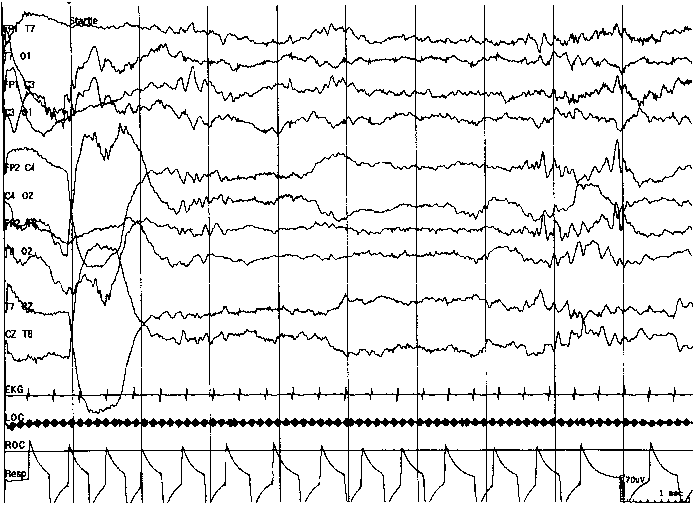 Specific gesta-tional features observed at this stage may include monomorphic occipital theta or delta activity, occurring in bursts lasting up to 5 or 6 s, sharp theta in the occiput of premature infants (STOP) (Fig. 2), and delta brushes (beta-delta complexes) initially confined to the Rolandic and occipital areas. 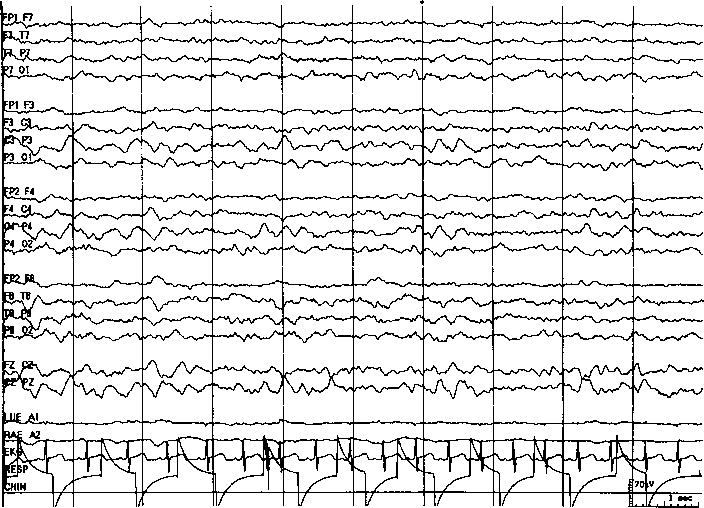 At this age, the EEG remains for the most part discontinuous, although the average duration of the interburst interval decreases (maximum ~60 s). Previously synchronous bursts of activity are now commonly asynchronous. This will persist, especially in quiet sleep (QS), until term and briefly beyond, during trace alterant. Brief periods of continuous activity correlate with active sleep (AS; rapid eye movement [REM] sleep) and irregular respirations, the earliest phase of differentiation of sleep-wake cycles. Specific gestational features include delta brushes that are more prominent in Rolandic, occipital, and parietal areas (Fig. 3). 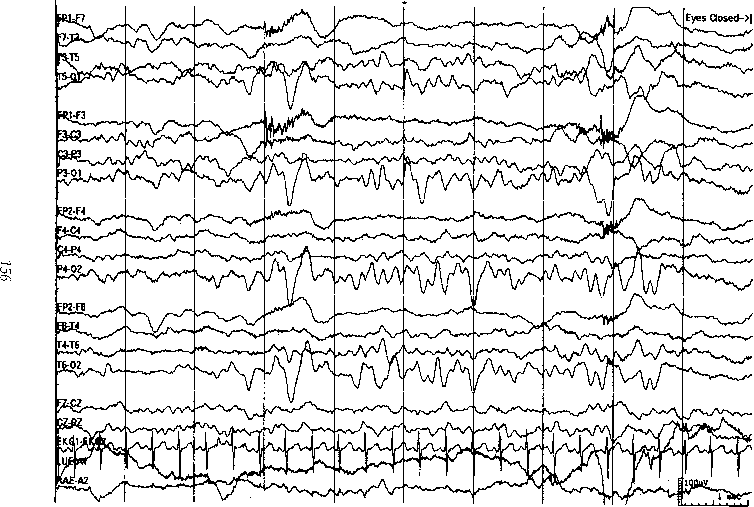 Bursts of higher voltage, sharply contoured theta activity become more common in the mid-temporal regions (temporal theta bursts). 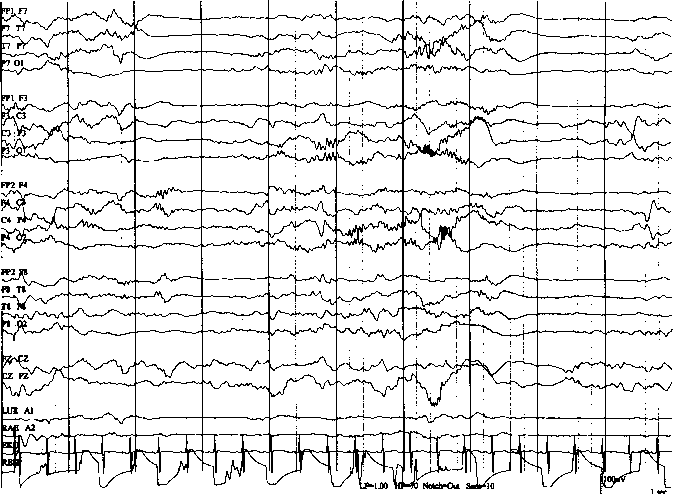 At this stage, cyclic state changes between wakefulness, AS and QS become more easily defined, and the relationship between these electrical states and the attendant respiratory (irregular respiration in waking and AS; regular in QS) and musculoskeletal (clonic chin movements in QS; REM in AS) patterns become more consistent. 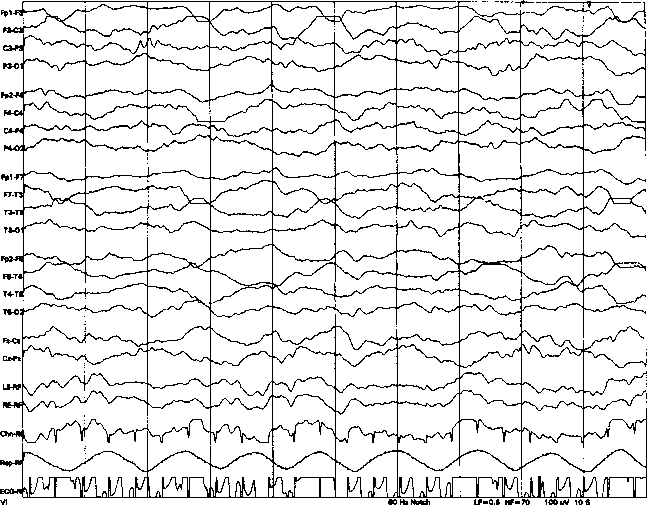 The EEG background is a more continuous mix of theta and delta activity in waking and AS, with continuing cycling through periods of trace discontinu. 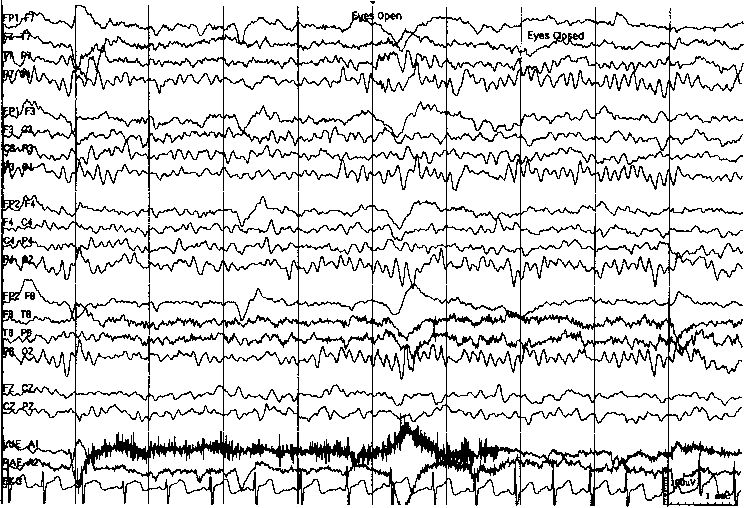 The infant now responds to stimulation with diffuse attenuation of background activity (Fig. 4). Temporal theta bursts give way briefly (33-34 wk) to temporal alpha bursts before largely disappearing by 34 to 35 wk. Delta brushes persist and become more clearly associated with QS (Fig. 5). Sharp waves occur predominantly in central and temporal areas. Positive temporal sharp waves may occur singly or in runs, unilaterally or synchronously in both hemispheres. Toward 36 to 37 wk, frontal sharp waves (encoches frontales; Fig. 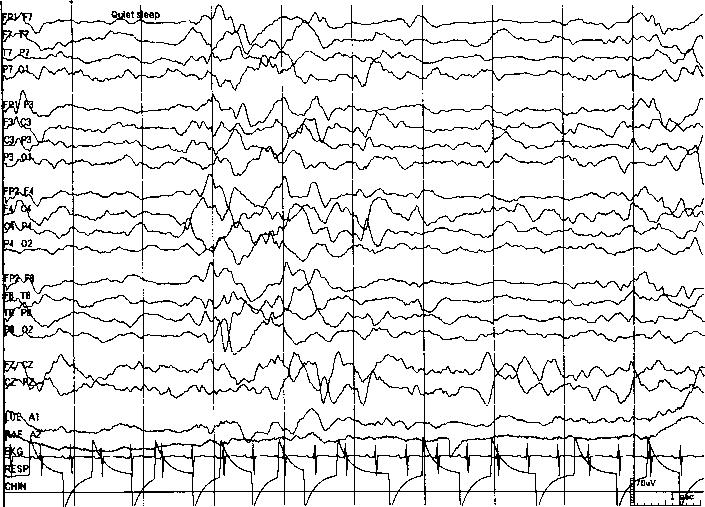 6), sometimes associated with rhythmic frontal delta activity (Fig. 7), become more prominent, and sharp waves in other areas wane in frequency. Sleep-wake cycles are now fully developed. The waking record is a continuous mixture of frequencies. Infants at this stage move directly from waking into AS, characterized by two patterns of activity (mixed-frequency AS [Fig. 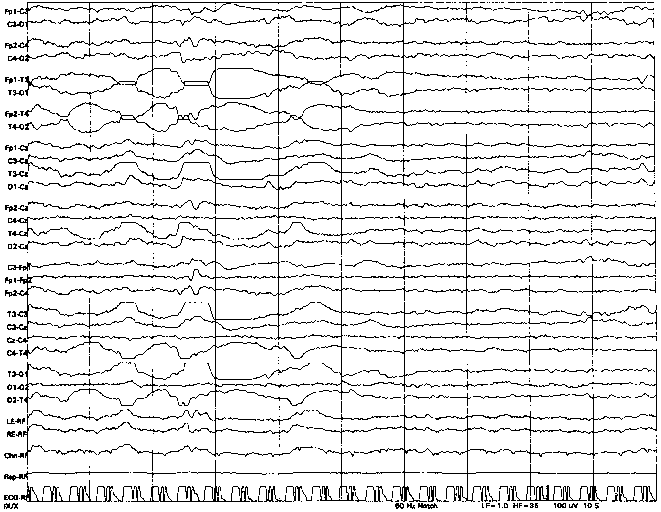 8], and low-voltage irregular sleep [Fig. 9]), both associated with irregular respiratory pattern and REM. 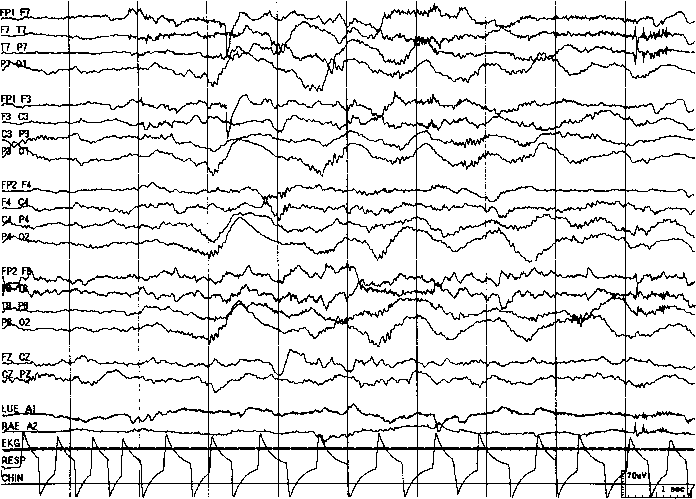 QS is associated with two patterns on EEG, trace alternant (Fig. 10), which persists to 46 wk conceptional age, and with high-voltage slow pattern (Fig. 11), both of which are associated with regular respiratory pattern and absence of eye movements. Frontal and temporal sharp transients persist, observed predominantly in QS, but wane by 44 wk conceptional age. Interhemispheric synchrony is complete in waking and virtually complete in sleep. Fig. 1. Twenty-six weeks gestation. Trace discontinu. LE-RF, left eyelid to reference; RE-RF, right eyelid to reference; Chn-RF, chin to reference; LF, low frequency filter; HF, high frequency filter; Rsp, respiration. Fig. 2. Twenty-seven weeks gestation. Sharp theta in the occiput of premature infants (STOP). Fig. 3. Thirty weeks gestation. Delta brushes, prominent in the parietal areas. LUE, RESP, respiration. Fig. 4. Thirty-four weeks gestation. Startle, producing arousal with diffuse attenuation of background. LOC, left outer canthus; ROC, right outer canthus; Resp, respiration. Fig. 5. Thirty-four weeks gestation. Occipital delta and delta brushes. RESP, respiration; LUE, left under eye; RAE, right above eye. Fig. 6. Thirty-six weeks gestation. Frontal sharp waves (encoches frontales). Fig. 7. Thirty-six weeks gestation. Frontal sharp waves and rhythmic frontal delta. Fig. 8. Term. Active sleep, mixed-frequency pattern (note irregular respirations). RESP, respiration; LUE, left under eye; RAE, right above eye. Fig. 9. Term. Active sleep, low-voltage irregular pattern. RESP, respiration; LUE, left under eye; RAE, right above eye. Fig. 10. Term. Quiet sleep, trace alternant pattern. RESP, respiration; LUE, left under eye; RAE, right above eye. Fig. 11. Term. Quiet sleep, high-voltage slow pattern. Rsp, respiration; LF, low frequency filter; HF, high frequency filter; LE-RF, left eye to reference; RE-RF, right eye to reference; Chn-RF, chin to reference. 6 mo, and faster (?) 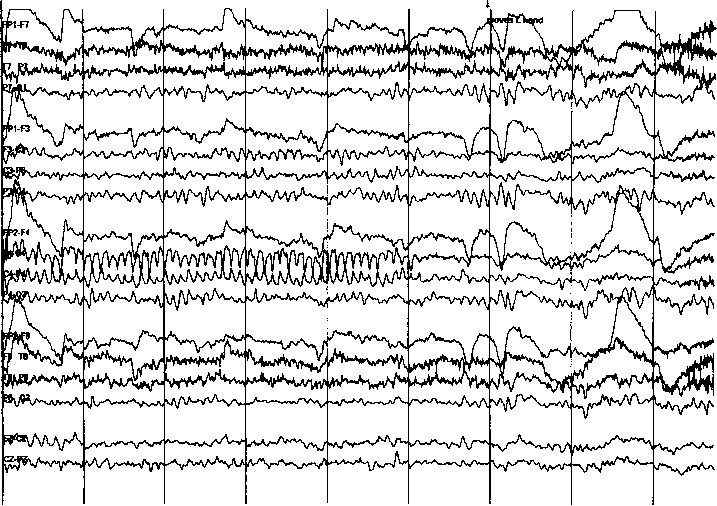 rhythms up to 8 Hz are observed in the central/Rolandic areas by 12 mo. Activation by photic stimulation is most likely to produce a driving response in the lower theta frequencies. After the first to second month, infants move from wakefulness into QS (Fig. 15), instead of directly into AS. The drowsy pattern is characterized by nonspecific slowing and increase in amplitude in the first 6 mo. Thereafter, drowsiness is manifest by an increase in diffuse, highly synchronous and rhythmic, theta activity (hypnagogic hyper-synchrony). 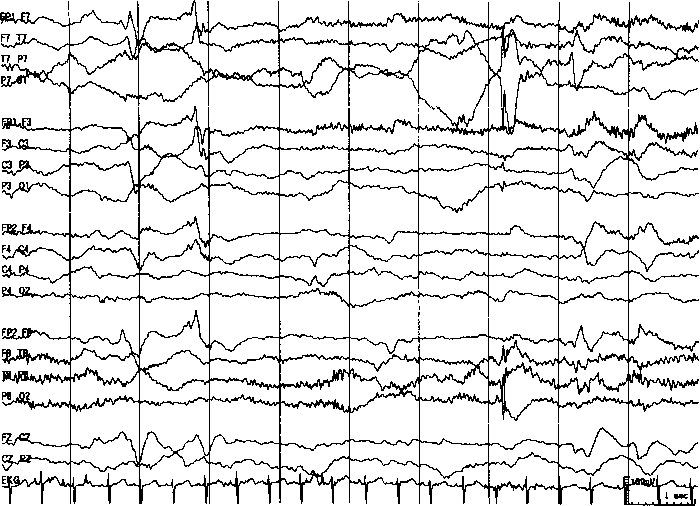 Sleep spindles develop by 3 mo of age, although fragmentary forms may be observed shortly after term (Fig. 16). Spindles in infancy are typically comb-like, with rounded positive and a sharper negative component. They increase to a maximum duration (up to 10 s) at approx 6 mo of age, and are maximal in the central and parietal areas, rather than at the midline, at this age. They are commonly asynchronous. Vertex waves appear between 3 and 5 mo. They are broader, and less sharply contoured than later in childhood. 7 to 8 Hz in the third year, and the blocking response to eye opening is now robust (Fig. 17). As in adults, the dominant rhythm may be of greater amplitude in the nondominant hemisphere. The difference should not be greater than 50%. In the waking background, delta activity remains prominent and may be observed diffusely or shifting in position throughout the record. There is a relative increase in the amount of theta activity, and this is visually the most striking frequency at this age. Throughout childhood, waking theta activity is prominent, often shifting in prominence from side to side. Children of this age are usually unable to cooperate with hyperventilation, but occasionally sobbing may induce diffuse slowing caused by a hyperventilation effect (Fig. 18). Occipital driving response to photic stimulation is still more likely at slower stimulation rates. 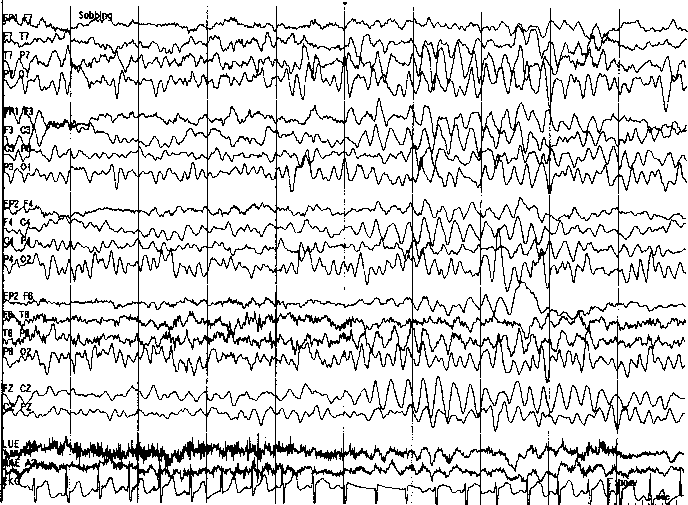 With drowsiness, diffuse, high-voltage, rhythmic theta (3-5 Hz) appears, mainly in the parasagittal areas. It is typically continuous, but may appear as discrete bursts in some children. It is often also present at arousal (hypnagogic and hypnopompic hypersynchrony) (Fig. 19). 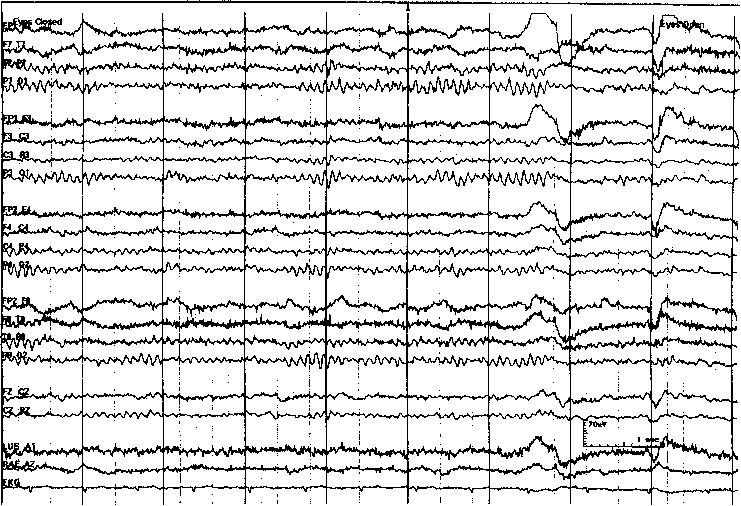 As the child progresses into sleep, diffuse irregular slow activity (1-3 Hz) develops, mixed with medium voltage theta activity. Slow activity has a maximal amplitude in the occipital leads (Fig. 20). Vertex sharp waves appear, which are now of higher voltage and more sharply contoured than previously. Runs of vertex sharp waves may occur (Fig. 21). Spindles, usually 12 to 14 Hz, may have a wider field, and are mostly synchronous by 2 yr of age. Fig. 12. Four months. Four per second posterior rhythm; LF, low frequency filter; HF, high frequency filter. Fig. 13. Twelve months. 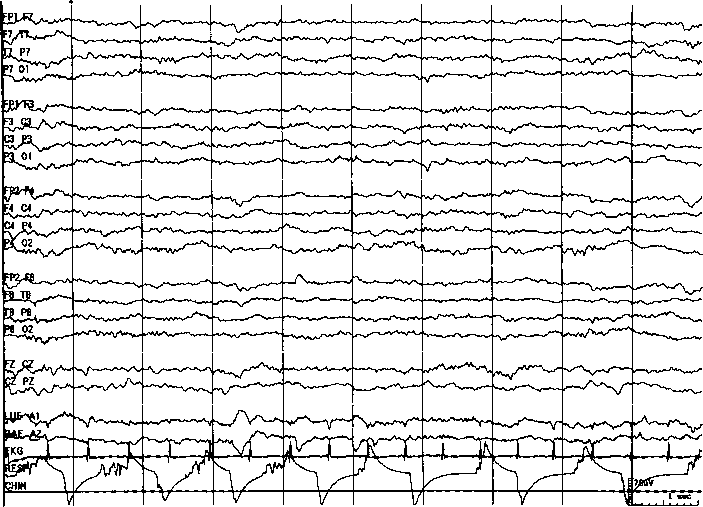 Six per second reactive posterior dominant rhythm; LUE, left under eye; RAE, right above eye. Fig. 14. Four and a half months. Five per second central activity, four per second posterior rhythm; LF, low frequency filter; HF, high frequency filter. Fig. 15. One month. Quiet sleep. RESP, respiration; LUE, left under eye; RAE, right above eye. Fig. 16. Three months. Asynchronous sleep spindles; LF, low frequency filter; HF, high frequency filter. Fig. 17. Three years. 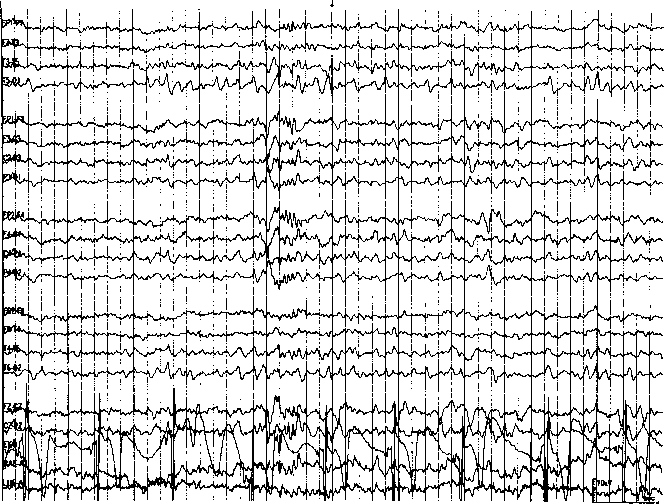 Reactive posterior dominant rhythm in the alpha range (8/s); LUE, left under eye; RAE, right above eye. Fig. 18. Three years. Sobbing produces hyperventilation effect; LUE, left under eye; RAE, right above eye. Fig. 19. Three years. Hypnagogic hypersynchrony with drowsiness; LUE, left under eye; RAE, right above eye. Fig. 20. Three years. Sleep—spindles with frontal maximum, delta with posterior maximum; LUE, left under eye; RAE, right above eye. Fig. 21. Three years. Sleep—V wave and run of V waves (transverse montage). Fourteen per second spindle with vertex maximum; LUE, left under eye; RAE, right above eye. At this age, the posterior basic rhythm consistently reaches alpha frequency. It is still of high amplitude, often greater than 100 ^V. Throughout early childhood, low voltage background (<30 ^V) is abnormal. Posterior slow waves of youth emerge at this age (Fig. 22). 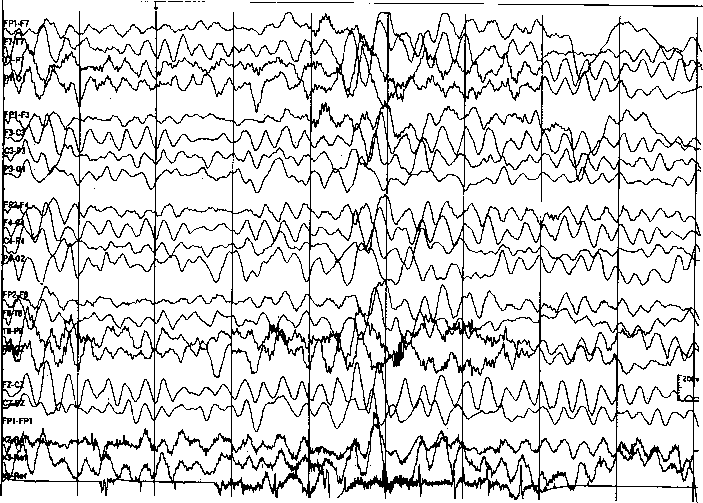 These are 1.5- to 3-Hz waves, maximal in the occipital region. They are intermixed with posterior alpha, and, at times, fused slow waves can resemble occipital sharp waves, although lacking typical morphology and after-coming slow wave. Posterior slow waves, in common with the posterior dominant rhythm, block with eye opening. This pattern persists throughout childhood and adolescence, disappearing in young adulthood. Rolandic mu rhythm may be apparent at this stage, often shifting from side to side. Children can now cooperate with hyperventilation. Hyperventilation produces prominent diffuse slowing to 3 to 5 Hz, which may be more apparent on the left initially, although becoming symmetrical (Fig. 23). This response is enhanced by fasting. It may persist beyond apparent cessation of hyperventilation if the child continues to breathe deeply. Intermittent photic stimulation is still associated with a driving response at stimulation rates less than 8 Hz. Drowsiness is often still associated with hypersynchrony, as described in Section 2.2.2. Vertex waves are increasingly sharply contoured. Spindles are now maximal in the midline, at 14 Hz, decreasing to 10 Hz with deeper sleep. Sleep-related slowing is still maximum in amplitude posteriorly. 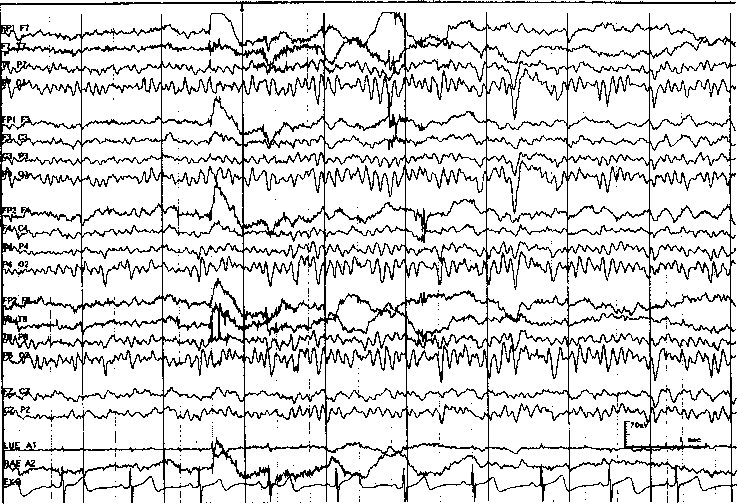 Positive occipital sharp transients of sleep (POSTS) are not yet expected, and, if present, are poorly formed. Frontal arousal rhythm in the theta range may be observed, but is more common later. Posterior dominant rhythm reaches 10 Hz by 10 yr of age, and reaches its maximum amplitude before that age. Posterior slow waves are prominent, and may be asymmetric, with higher amplitude on the right, as with the posterior dominant rhythm. Medium voltage semi-rhythmic frontal theta activity may be observed in healthy children at this age, and may persist into young adulthood (Fig. 24). There is increasing prominence of the mu rhythm (up to 15-16 yr) (Fig. 25). Lambda waves may be observed posteriorly with saccadic eye movements in response to patterned visual stimulus. Hyperventilation still produces high-voltage slowing (1.5-4 Hz). Intermittent photic stimulation now stimulates driving at 6 to 16 Hz. 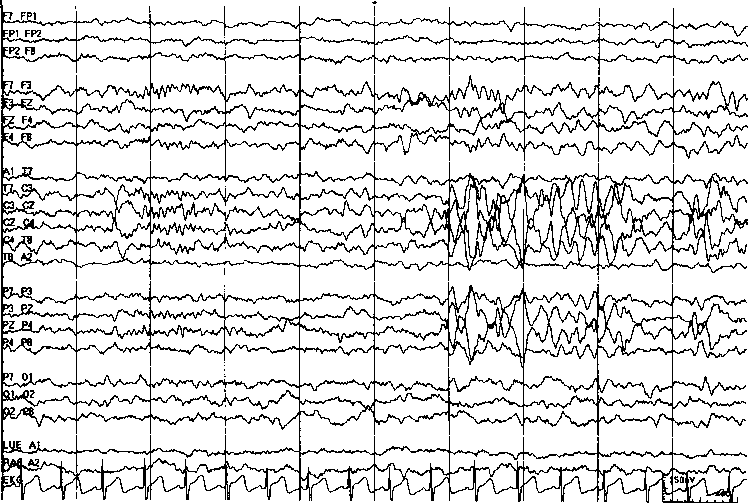 Hypnagogic hypersynchrony is disappearing, and is rare after the age of 6 yr. The drowsy pattern at this age is gradual alpha dropout, with increasing amounts of theta and delta activity. Vertex sharp waves are still prominent, with large amplitude, and may have asymmetric field over the midline. Spindles are now disposed anteriorly over the frontal midline, and typically last less than 1 s. Fully developed POSTS are observed for the first time (Fig. 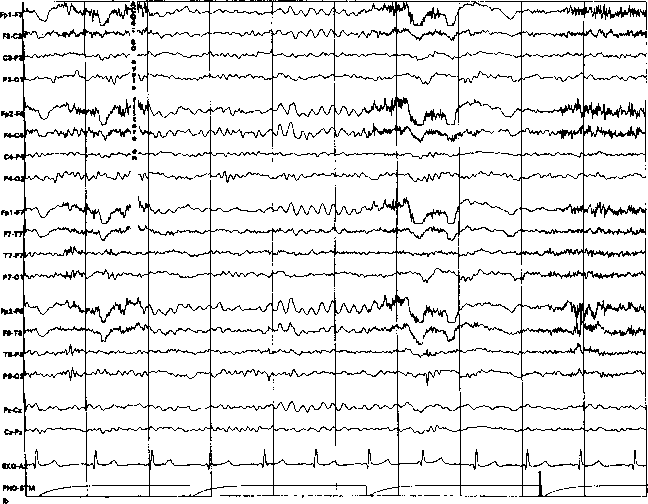 26), and other sleep patterns, such as 14- and/or 6-Hz positive sharp waves are more common. 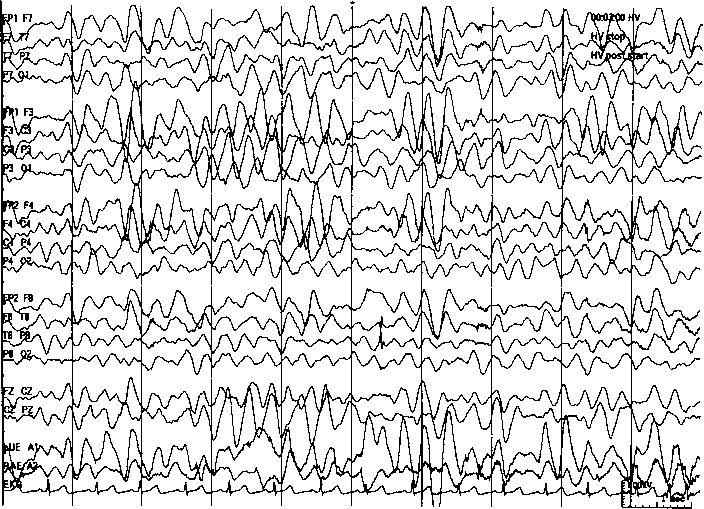 At this age, the EEG begins to resemble the adult EEG more closely, as the amount of underlying delta activity wanes completely (Fig. 27). The amplitude of the posterior dominant rhythm also declines gradually, although it remains higher than in adults throughout this period in many children. The mu rhythm reaches its maximum prominence at 15 to 16 yr, waning thereafter. Hyperventilation-related slowing is less pronounced, and the response to intermittent photic stimulation is mature, with a driving response occurring over the range 6- to 20-Hz stimulation. Fig. 22. Six years. Posterior slow waves of youth; LUE, left under eye; RAE, right above eye. Fig. 23. Six years. Hyperventilation—diffuse slowing; LUE, left under eye; RAE, right above eye. Fig. 24. Nine years. Frontal theta. PHO-STM, photic stimulation; LUE, left under eye; RAE, right above eye. Fig. 25. Twelve years. 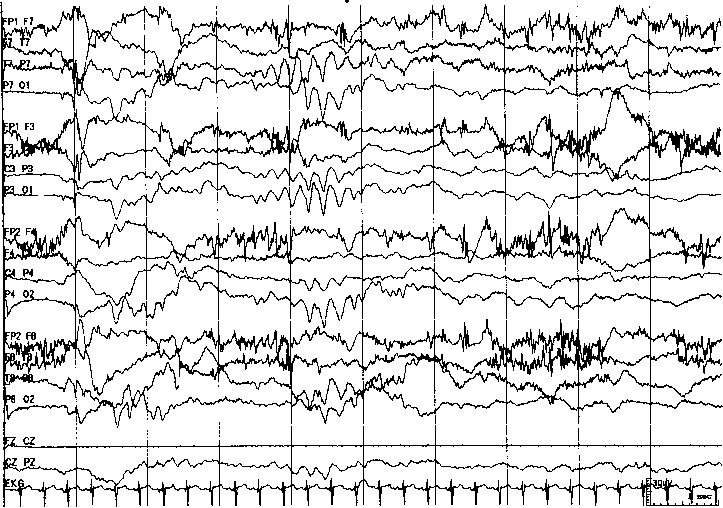 Mu rhythm on right, responds to movement of left hand; LUE, left under eye; RAE, right above eye. Fig. 26. Twelve years. Sleep—positive occipital sharp transients of sleep; LUE, left under eye; RAE, right above eye. Fig. 27. Sixteen years. 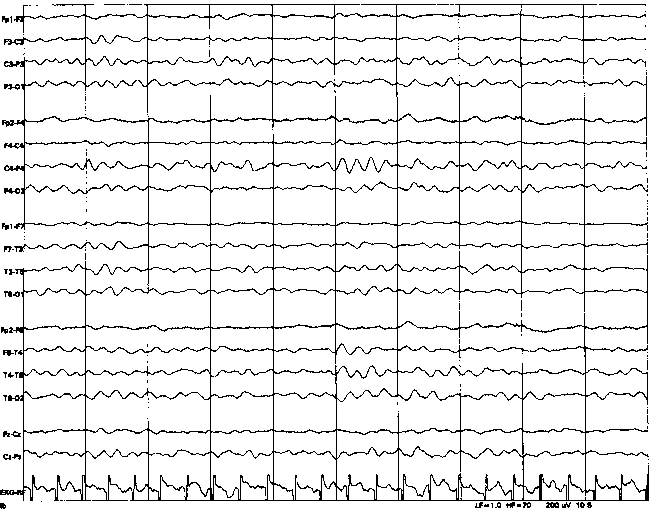 Awake EEG, little delta activity remains; LUE, left under eye; RAE, right above eye. The drowsy pattern is now mature, with alpha dropout, and replacement with a low-voltage mixture of slow and fast activity. Prominent V waves remain, still sharper in contour than in adulthood, but less so than earlier in childhood. Spindles are mature. POSTS are abundant and mature. They may occur in semiregular runs and resemble an occipital rhythm. 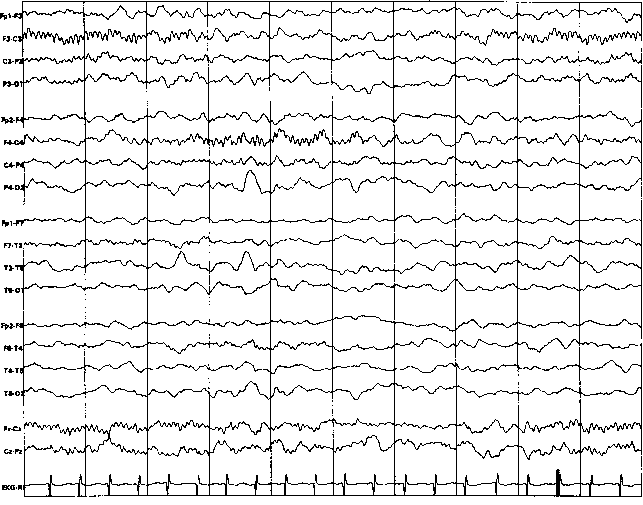 Fourteen- and/or 6-Hz positive sharp waves are not uncommon in sleep.